Nicholas Jones is a Melbourne-based sculptor who makes works from books and printed paper. Julia Ciccarone first met him five years ago when they both gave a talk at the State Library of Victoria in Melbourne. 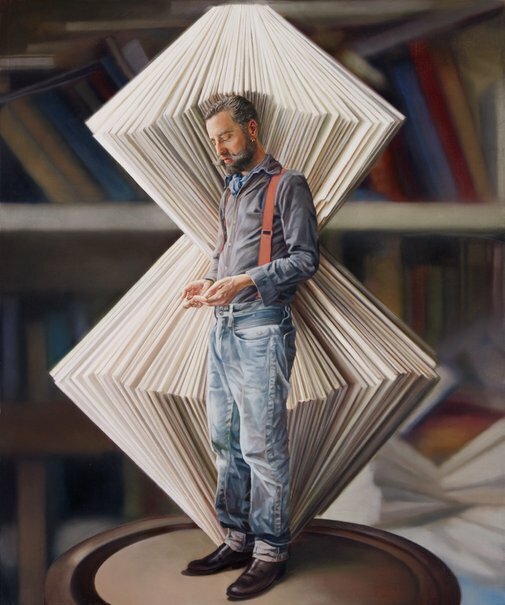 Ciccarone has featured one of Jones’s paper sculptures in the portrait but has played with the scale. In reality the sculpture is far smaller – around 25 centimetres high. Ciccarone’s atmospheric paintings exude a strong sense of narrative drama. In 2007, keen to make one of her paintings move, she enlisted the help of Kazimir Burgess who directed a short film called 67 , inspired by her painting This mortal coil . They followed this up with Lily , which won Best Short Film at the 2011 Berlin International Film Festival. Now Ciccarone is working as art director on Burgess’s first feature film.